Yes, there's a gap between the third Case Files and this one, but not really. 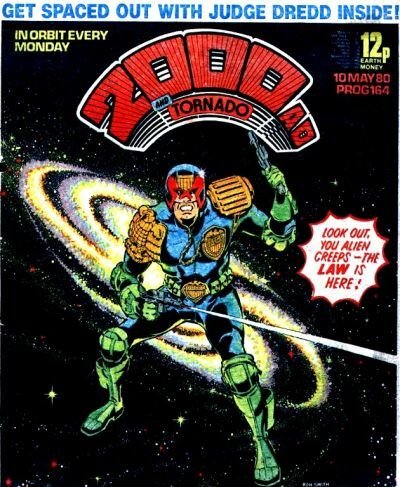 Judge Dredd didn't appear in 2000 AD #155, one of, I believe, only four issues he's missed. (The others were #1, #1100 and #1138; #268 included a reprint rather than a new story. Any others? EDITED TO ADD: Commenter Douglas, who is not me, points out that #351-352 were reprints too.) But there's a more significant break between volumes three and four. 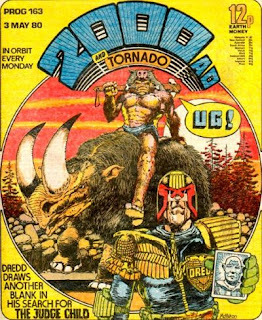 Somewhere in the middle of the "Judge Child" storyline, which began in #156 (dated March 15, 1980), John Wagner was joined by his housemate Alan Grant as co-writer of the Dredd feature; they'd write it (and a lot of other series--Strontium Dog, Robo-Hunter, ­Ace Trucking Co.) together for the next eight years. 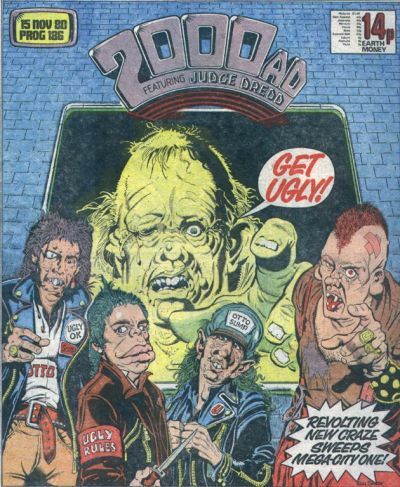 Their first major collaboration, though, "The Judge Child," is by far the most uneven of the long Dredd storylines--a singleminded premise pursued through an increasingly baroque series of complications, with some episodes that push the plot forward and others that kick it out of the way as a nuisance. It's hard to discuss it in any way other than "and then this happens, and then this happens": it's not just episodic, it's a bunch of almost entirely unrelated stories with a Find the Person premise threaded through them. It starts simply enough: Dredd is trying to find Owen Krysler, a precognitive mutant--or something--who's supposed to be very important to the future for handwaving psychic reasons but has inconveniently been kidnapped by Cursed Earth slavers. He thinks he's found Krysler in Faro's compound, but ends up getting the "Thank you Dredd! But our Judge Child is in another castle!" treatment. So Dredd pursues an evil monk (EVIL MONK! ), who's taken Krysler, to Texas City, where the Angel Gang kidnaps the kid again, having somehow upped their IQs enough to figure out that he's feeding Bunsen the answers to questions about the future. And then we get a middle-of-last-page caption--"that night the Angel Gang escaped from Earth on a hijacked space craft"--and "The Judge Child" abruptly turns into space opera, a form to which "Judge Dredd" is less than wholly suited. The "Planet of the Body-Brokers" section is notable for using the "biochip" idea over a year before Rogue Trooper first appeared, but also introduces another concept-too-many, "oracle spice." ("The spice is said to give important knowledge to those who take it. With it we could find the boy," Dredd announces in a particularly awkward bit of expository dialogue. 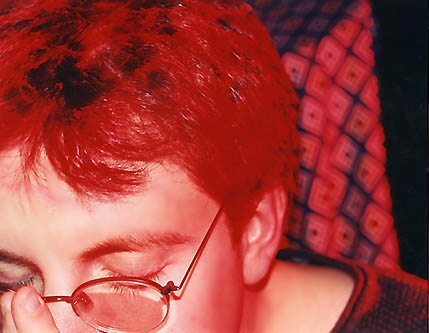 Or, you know, you could ask those precognitive Psi-Division types who got you into this mess?) "The Hungry Planet" is yet another Mike McMahon-drawn holding pattern; could it be that these chapters were being farmed out to a bunch of artists, designed to be run in whatever order they got turned in? The "Battlefield 8"/Planet Agros sequence is one of those writing tricks that Wagner defaults to from time to time: applying a glib, TV-derived tone (specifically sports announcing and commercials) to something formally inappropriate (in this case ground war). And, after three weeks' worth of it, we get the "Thank you Judge Dredd! But the oracle spice with which you can allegedly find our Judge Child is in another castle!" treatment. And so Grant and Wagner--with Bolland again--hang a lantern on the problem in "Block War," a six-pager that beats all of "The Judge Child" as far as I'm concerned. It's a very simple story, but it makes a great deal of what comes after it snap into focus: we see the Council of Five (at this time Quimby, Ecks, Pepper, McGruder--making her first appearance--and Griffin) discussing Dredd's role, and questioning his decisions. Dredd, we understand, is a leader in combat situations, but he's not an administrator; he's a street judge. And, in counterpoint to their conversation, we see the kind of block war that will eventually scale up into block mania, a year or so later; naming the blocks after Ernest Borgnine and Rita Tushingham gives a sense of just how many blocks there have to be for the naming conventions to get down to that level, too. Thereafter, things return briefly to the scattershot format of brief stories about nutty things in Mega-City One. There are a couple of oddities among the lot: two one-offs with a writer credit to "Alvin Gaunt" (a.k.a. Alan Grant with Kelvin Gosnell), and "Knock on the Door," drawn by Ian Gibson under his "Emberton" pseudonym in what looks like a hell of a hurry (compare it to the much more fully rendered piece "The Nightmare Gun," a few episodes earlier). As it turns out, "Knock on the Door" was a last-minute substitution for an episode of "The Mean Arena" in #195, the same issue as Part 3 of "The Fink"--I think that was the first time there were two Dredd episodes in the same issue. The longer stories, though, are the ones where the Wagner/Grant team start to click. "Otto Sump's Ugly Clinic" is a dumb idea pushed so far that it becomes kind of sublime--the punch line ("only the rich could afford to be ugly") is a coup de grâce. (That's a daring cover, too, for its time: note that Dredd isn't actually on it.) "The Fink" salvages an idea that got lost in the mayhem of "The Judge Child," and the artwork is Mike McMahon in top form: the looser and more rickety his line gets, the more fun it is to see his stuff. Also, it's the story that introduces Resyk, the facility in which dead citizens' bodies are broken down for useful chemicals. Clearly somebody cracked up over the line "we use everything but the soul." "Pirates of the Black Atlantic," though--that's a really peculiar one. Is it: a) a grand pirate adventure with Dredd fighting a giant squid? Or b) a brutal, dark antinuclear screed (it is, of course, not an accident that the nuked block is named after Bob Oppenheimer)? I'm sorry, that was a trick question: the correct answer is c) a prequel to "The Apocalypse War." Although it does seem to be weirdly out of touch with realpolitik: the conclusion, in which the Sovs respond to the discovery that they'd struck at Mega-City One (through one of their agents disguised as a terrorist) by nuking part of their own city--basically to say they're sorry--is entirely unlike anything any military power has ever done, as far as I know. Whatever happened to fighting wars with five-man teams? That actually seems more believable. Finally, we get "Unamerican Graffiti," the unprepossessing two-parter that introduced Marlon "Chopper" Shakespeare. (The conclusion was echoed by "Decade Later" from Brian Wood's series DMZ, but maybe it's inevitable for the conclusion of a "graffiti writer is finally caught by the law but gets his revenge after the fact" story.) Chopper turned out to be an unexpectedly durable character--he's survived at least twice when his writers intended to kill him off--and a great foil for Dredd. The Angel Gang are lawless psychopaths, the Dark Judges upend the "protecting citizens from crime" argument, P.J. Maybe is a criminal mastermind; they all play against Dredd's essence one way or another. But the absolute core of Dredd's character is paternalistic authority: "I am the law." Chopper recognizes no authority of any kind; he's somewhere on the anarchistic end of libertarianism. All he wants to do is be free to ride his machine without being hassled by the Man, as The Wild Angels put it. He himself is no physical threat at all to Dredd, or really to anyone else--all he can do is make Dredd lose face, but that's what makes him dangerous to what Dredd represents. Next time: if all goes well, Tucker Stone will join me for a conversation about The Complete Case Files 05, featuring "Block Mania" and "The Apocalypse War"! 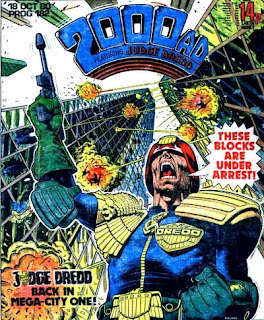 Progs #351-352 had Dredd reprints in them too. If I remember rightly, the story reprinted was "Mutie the Pig". The Sov-bloc self nuking in the Black Atlantic owes something, even if accidentally, to the denouement of brilliant sixties nuclear thriller Fail Safe. 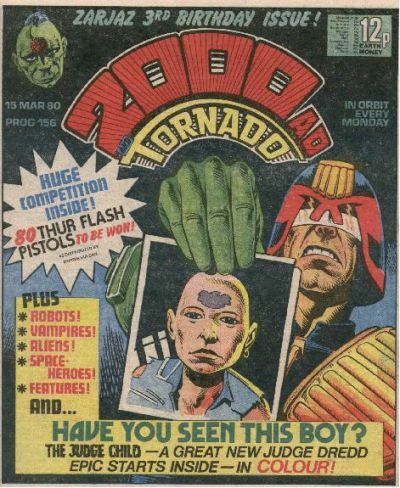 TBH, the episodic nature of The Judge Child is not that much different from what has gone before - the Luna trip was basically just an excuse to have Dredd in a different location having the same kind of adventures, then The Cursed Earth was again largely Dredd in a different location having slightly-more outdoorsy adventures (it's the Wilderness Survival Guide of Dredds!) and other mega-epics would follow the same pattern. Even The Apocalypse war, pretty much the bets of the epics, was pretty bitty and episodic and lurched about a bit. 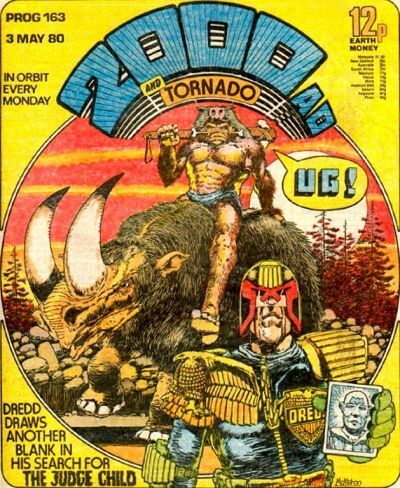 Dredd was always just as much about the weekly thrill as the grand arc, and the epic was largely a hanger for those weekly thrills. 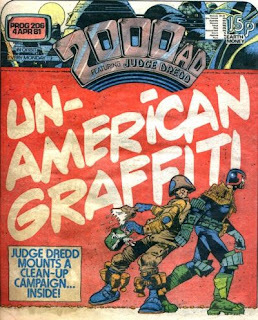 DMZ always seemed to me to be Judge Dredd without Judge Dredd, so I'm not at all surprised to see the comparison between "Unamerican Graffiti" and "Decade Later" here.